Raindrops fall to earth on “headwaters mountain” near the northern Potter County village of Gold in the Pennsylvania Wilds Dark Skies landscape. At an elevation of nearly 2,500 feet, it’s amazing the direction those raindrops go, how far they travel and where they end up. 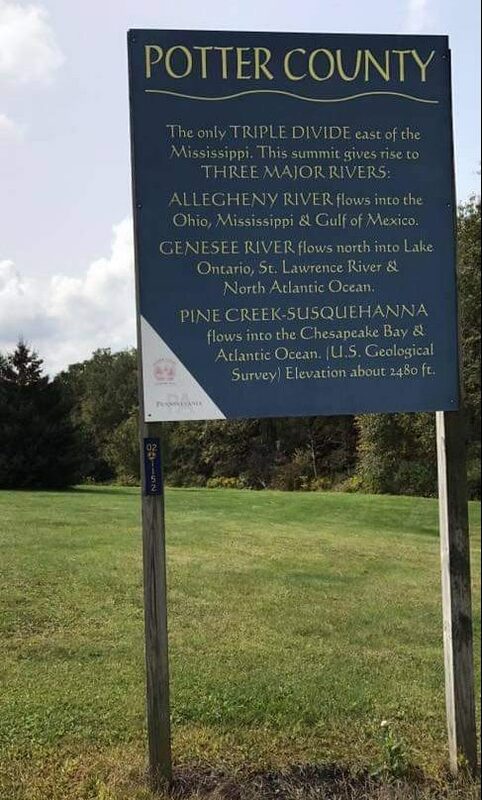 This is something geologically unique to these Pennsylvania Wilds because Potter County is home to the only Triple Continental Divide east of the Mississippi River, where rainfall travels in three separate directions to the sea. At the end of a gravel road, in a pasture atop the mountain, raindrops falling in the same area, a mere few inches apart, will merge into one of three springs. All within less than a thousand yards of one another, the descent of these three springs becomes the starting point for three major rivers and primary watershed divides, one north, one west, the other east. “If this very spot was located on a manicured golf green and not a pasture, and if a golf ball was dropped on this spot, it would roll in the direction of one of those three springs,” said Williamsport mapmaker Larry Seaman, who along with Karl Ings writes and publishes Professor Higbee’s Stream and Lake Maps, the most detailed waterway maps available in the United States. Seaman and Ings were able to pinpoint and eventually find the Triple Continental Divide location after deciding to go for a ride one day to explore an unusual spot appearing on one of their Potter County maps. Three tiny springs eventually become small brooks, then large streams, which become whole rivers that go to one of three seas, the Atlantic Ocean, the Gulf of Mexico and the North Atlantic Ocean. The Allegheny passes through Coudersport, winding its way briefly through southern New York State then through the Kinzua Dam, through a portion of Pennsylvania Wilds Allegheny National Forest and Surrounds landscape, south to Pittsburgh before joining the Ohio River, where it joins the Mississippi River and ends up in the Gulf of Mexico. Another spring on the mountain forms Pine Creek (formerly known as Tiadaghton) in the Pennsylvania Wilds Pine Creek Valley and PA Grand Canyon landscape, which goes to the West Branch of the Susquehanna, then to the Susquehanna River, on to the Potomac River and into Chesapeake Bay, before ending up in the Atlantic Ocean. The third spring travels north and forms the Genesee River, which flows up through New York state to Lake Ontario then to the St. Lawrence Seaway before heading out into the North Atlantic Ocean. It begins, that on this mountaintop in Seneca country lived a wise Native American chief named Nahimen, who was gifted with the power of second sight. He saw so clearly into the future that it often caused him misery. A widower with three beautiful daughters, Nahimen was saddened when he foresaw the future of his daughters, Gay-nay-sayo (Genesee), Allie-gay-nay (Allegheny) and Tya-dahg-tun (Tiadaghton). They were all destined to fall in with evil associates and become corrupted. This was also communicated to him through his late wife’s spirit as she spoke to him often. The only way to save their daughters from an awful fate, she said, was to change them into “something everlasting such as a tree, a rock or a river.” This could be done with the aid of Alliakquot, an elderly sorceress, she said. The next morning at first light, Nahimen found three springs. When he bent over each spring, he saw the faces of his daughters reflected in their watery depths. They appeared joyous and happy. Feeling the companionship of his daughters-of-water, Nahimen died as he lay upon buffalo hides in his lodge, listening to the three streams as they cheerfully flowed over mossy rocks on their way down the mountain. Legend has it that Nahimen was buried atop headwaters mountain near where the three springs rose and mapmaker Larry Seaman recalls standing at this exact location, “The end of this story mentions a high point between the springs as the chief’s resting spot. The spot we were at was also the high point and could possibly be the chief’s final resting place. Amazingly, it is the exact pivot point for the three major watershed boundaries,” explained Larry. As the early settlers arrived, agriculture became a way of life and continues today in Potter County. Understandably, water quality is of prime concern. In September it was announced that Potter and Tioga counties will be part of a national “Water for Agriculture” study. The study holds the potential to not only help farmers with water management issues – both quantity and quality — but also breaks down some of the barriers that have isolated farmers from government regulators and communities. In recent years, when natural gas drilling companies moved into Potter County, residents and officials alike welcomed the new jobs, but also grew concerned about the impact on the local water supply. Two agencies, based in nearby Coudersport, are devoting much time and resource to ensuring that the water quality in the Triple Divide region remains as pure as possible. One of them, the Triple Divide Watershed Coalition (TDWC), was formed in 2011 to protect public drinking water sources within the headwaters region of the Allegheny, Genesee and Susquehanna River systems. The Coalition consists of representatives from each of nine area community water suppliers, County government, Department of Environmental Protection, the Penn State Extension and the Potter County Conservation District. The TDWC earned high honors, winning the Pennsylvania Governor’s Award for Local Government Excellence, but its work had only begun. Over at the Potter County Conservation District headquarters, Outreach Advisor Emily Shosh said the District’s mission is to ensure protection of natural resources through project implementation, environmental education, technical assistance to land owners and fostering Partnerships. She said the District also administers the Pennsylvania Clean Streams Law. This includes reviewing permit applications and E&S (Erosion & Sediment control) plans, performing field inspections, investigating complaints, providing technical assistance and when necessary, referring cases to appropriate regulatory agencies for action under the PA Clean Streams Law. Seeking a PA Wilds brewery? Look no further.